La Toussuire is a great option for families looking for a good-value, friendly resort. The resort has a reasonably compact centre and a pedestrianised main street. There are a number of restaurants, pizzerias and creperies to enjoy in the evenings, and grocery shops for those wanting to self-cater. The resort has its own sledging slope and there is a selection of winter walking trails and snowshoe hikes for those who want to explore the area in different ways. 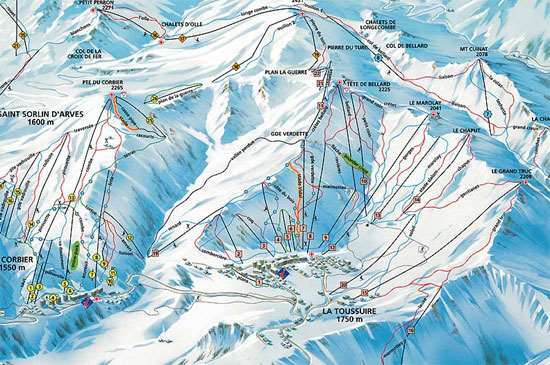 La Toussuire is part of the Sybelles ski area and links with neighbouring resort Le Corbier via road and pistes. Located on a vast plateau at an altitude of 1,800 metres, the resort has panoramic 360° views. La Toussuire’s local ski area has 45km of pistes, mainly graded blue and red, which beginners and intermediates will enjoy. In the wider Sybelles area, there are 310km of pistes in total, with the main linking runs between resorts also blue or red so intermediates can really explore the full area. Experts will find that there is not much in the way of steep, testing runs, however there are some great mogul slopes and plenty of off-piste to explore. There is a snow park for both beginners and more seasoned pros, plus a 1.5km boardercross track. Cross country skiers will find 30km or trails in the area.